Spring sprung, and we have rushed into a lush summer. Jessah has been busy refurbishing some of the flower beds, because some plants were lost due to the warm spell in February, however the beds are coming together nicely now and will shortly be ready to greet butterflies and other visitors! We will be updating the web site and showing photos of what has been seen so far this year – watch for it, any day now. 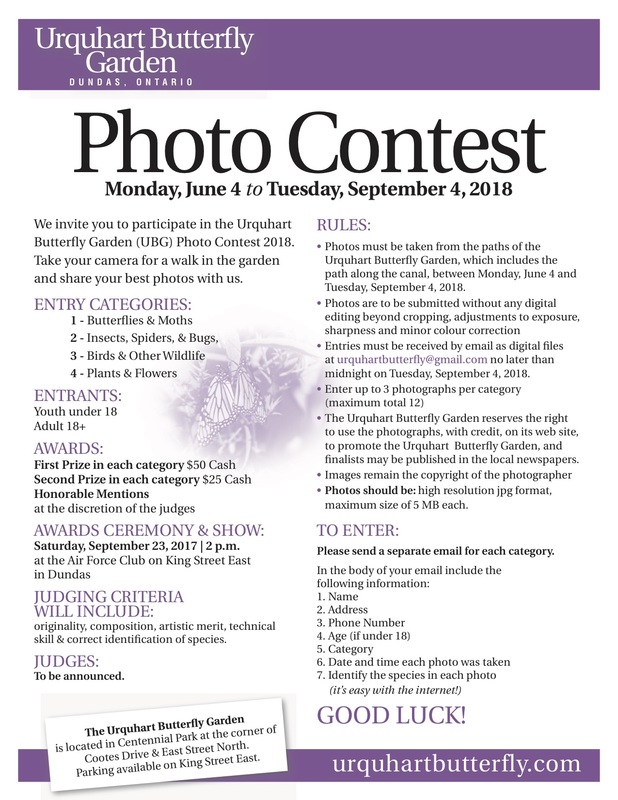 The photo contest is already open so start those shutters clicking. Flyers will be available in the Garden later this week. Good Luck. 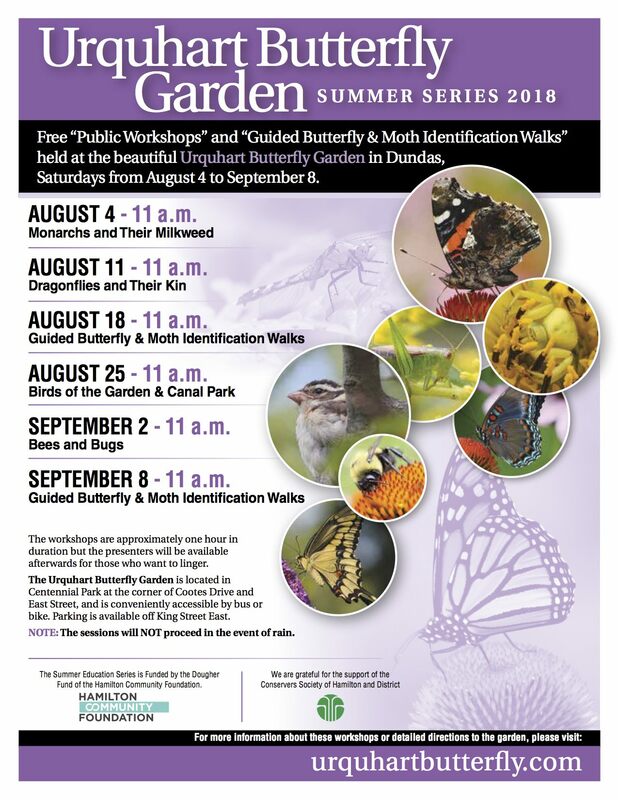 Summer has just slipped by, and it’s time for a general pruning and fall cleanup at the Urquhart Butterfly Garden. Digging out all the goldenrod always seems an endless task in itself. Then the Korean Lilac must be protected from the deer because they just love eating all the flower buds in the spring; we must mulch with straw between the shrubs, and many other things, – so much to do, so little time! The chief gardener for this year is Jessah Hodgins, and many of you will have met her. Just when it looked as though summer was well and truly over Jessah pointed out a Red Admiral 2 days ago. A very nice surprise. We also have seen a pair of Mockingbirds in the garden for the past week, they are very quiet and shy; busy eating the Elderberries and other fruit. The major task this summer was completing all the new panels on the kiosk. We were lucky to get a Trillium Grant which covered the costs, because it would have been quite beyond our means. Michelle Sharp took almost all the photographs and did the design – what would the Garden do without her? The Awards Ceremony for the Photo Contest took place on September 24 at the Air Force Club. The award winners are posted on this web site here or under UBG photo competition drop menu. The photos are terrific and if you have not seen them already you will enjoy looking at them. 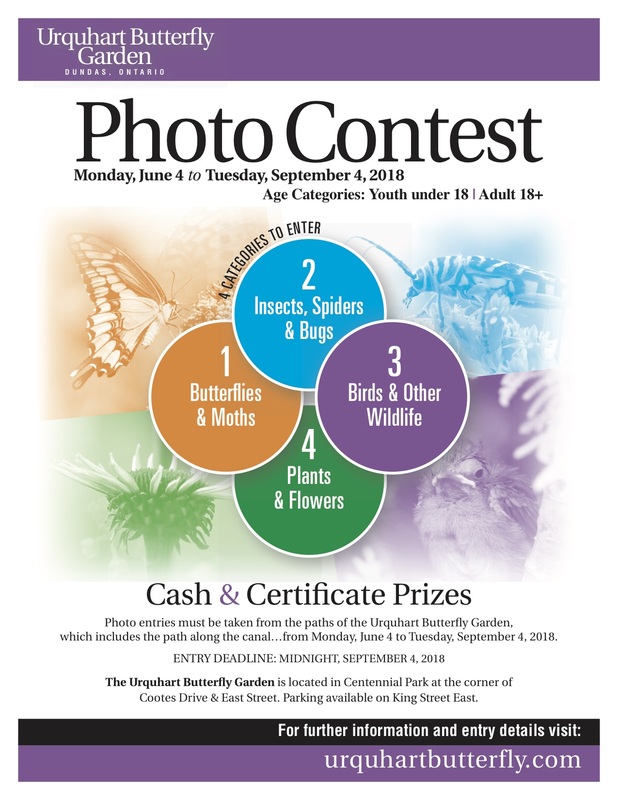 Next year the Photo Contest will run for a longer period, beginning in Mid June and ending in early September. The good news for the fall is that Jessah is going to be the chief gardener again next year, plus she will be taking on additional tasks, such as keeping the web site up-to-date, helping with the Educational Programme and running the Photo Contest. Michelle will take photos once every week or so through the winter, and we shall be posting them, to give us a boost through the long months ahead. Look forward to seeing you all next year! 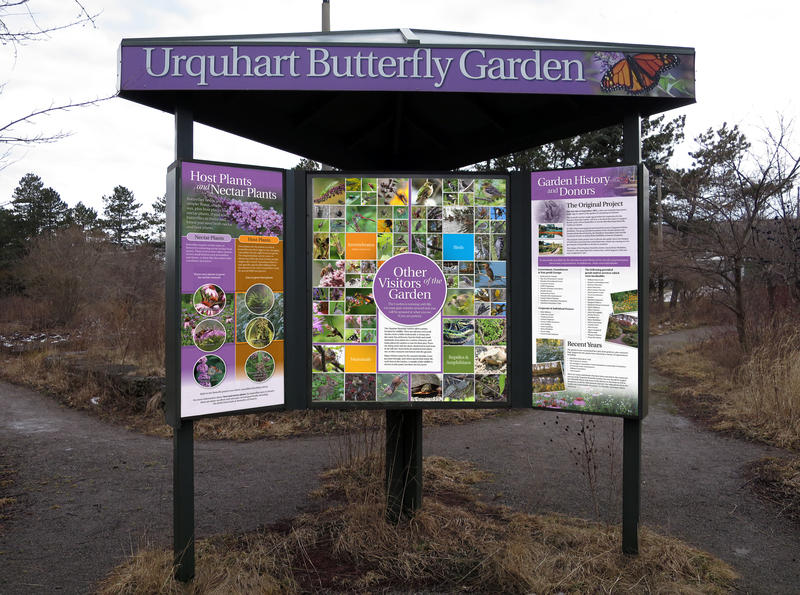 Urquhart Butterfly Garden Kiosk – Updated! Thanks to a generous grant from the Ontario Trillium Foundation the old panels on the UBG kiosk have been replaced with colourful new ones. The beautiful eye-catching new panels have been designed by Michelle Sharp who also took almost all the photos. 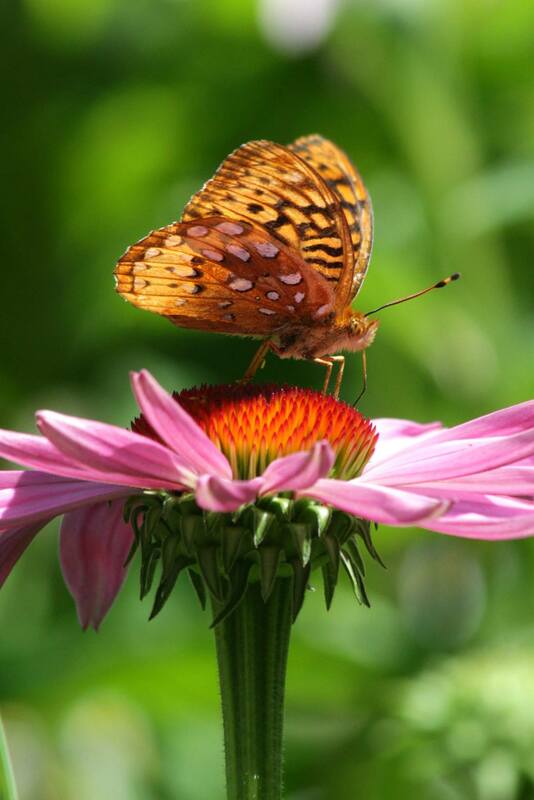 Welcome to the Urquhart Butterfly Garden, in 2016! This year we hope to once again be hosting a Summer Programme on Saturdays during August and September, as well as a Photo Contest from mid July until the end of August. We will also be publishing more brochures on specific subjects; continuing the revamp of the kiosk; starting new plantings and new signage. We will update you all on our progress as it happens. At the moment we are just waiting for the rain to stop for a few days so we can begin our Spring cleanup. However, before we move into complete Spring mode, we thought you would like to see some photos taken during the winter and early 2016, these are posted on the site and all were taken by Michelle Sharp.